Most recognize the work of Mexican artist Frida Kahlo through her brightly colored self portraits. What many don’t know about is the collection of the more than 6,000 photographs she owned. These photographs were held from the public at the request of her husband painter Diego Rivera. Kahlo’s father made his living as a photographer and passed this interest onto his daughter. In 2007 the photos were released to the public. 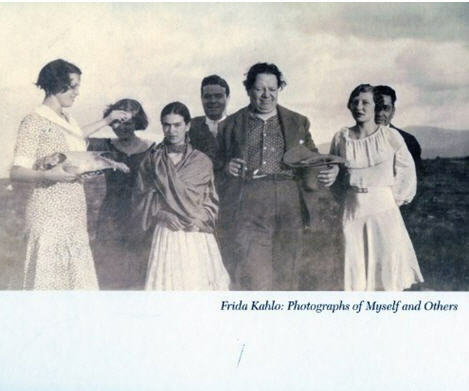 Some of the photos are credited to Kahlo but some may be have been taken by some of her friends, Edward Weston, Manuel Alvarez Bravo, and Tina Modotti. Frida Kahlo: Her Photos, is an exhibit of 240 photos from her collection that can be seen at Artisphere, in Arlington VA. The exhibit was curated and based on the book by Mexican photographer, Pablo Ortiz. The exhibit originated at the Museo Frida Kahlo. Read more at the Washington Post and at ArtInfo. I recently saw some work done by Diego Kahlo Fine Art in Chicago, and it was somewhat reminiscent of Frida's work. You'd almost think they were distant relatives!